The wingless viviparae of Thelaxes are small (1 - 2.3 mm) oval and brown or greenish, sometimes with a paler stripe along the back. Their rostrum is distinctive in having a long and almost needle-like last rostral segment. The cauda is knobbed and the siphunculi are very short and virtually pore-like. There are 4 Thelaxes species, which feed on the young shoots, leaves and young acorns of various Oak species (Quercus: Fagaceae). Three species are in Europe and the Mediterranean region, and one in North America. They have a sexual stage in the life cycle, but do not host alternate. 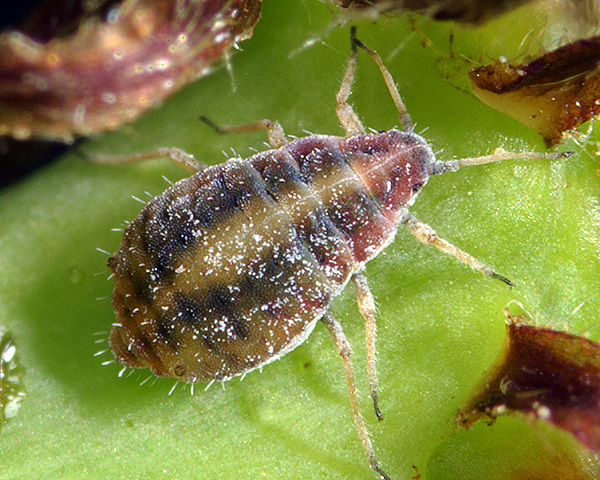 Thelaxes aphids are usually attended by ants. The wingless viviparae of Thelaxes dryophila (see first picture below) are oval, rather flattened, dark brownish-red to purplish grey with a paler spinal stripe. Their antennae, legs, siphunculi amd cauda are brownish. The antennae are 5-segmented and are slightly less than half as long as the body. Their terminal process is less than half the length of the base of the last antennal segment. Hairs on abdominal tergite 5 are spine-like (cf. Thelaxes suberi which has those hairs very thick and dagger-like, and occurs on oak species other than Quercus robur). Winged females (see second picture above) have a black head and thorax with the antennae, legs, cauda and areas around the siphunculi dark. The abdomen has dorsal cross bands on the rear segments and dark marginal plates. 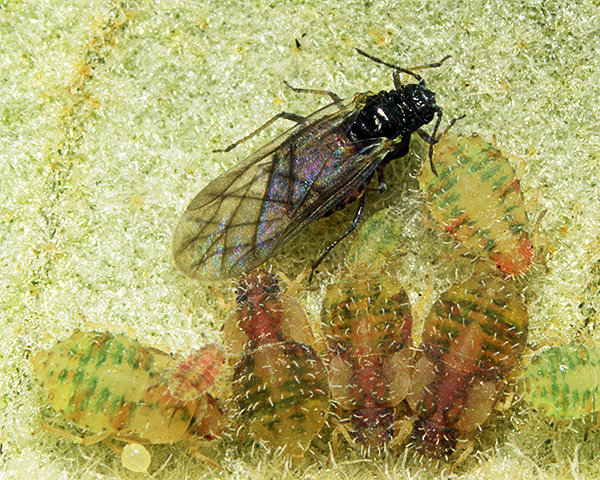 Unlike most aphids, the wings of Thelaxes dryophila are folded horizontally, rather than tent-like, over the abdomen. The common oak thelaxid does not host alternate, but remains all year on oak (Quercus spp.). Colonies at the tips of the shoots spread on to stems, leaf petioles and along mid ribs on the undersides of the leaves. They are also found on the developing acorns. Immature sexual forms are produced in early summer, but then aestivate until autumn when mating takes place, and eggs are laid. Thelaxes dryophila occurs in Europe, the Mediterranean region and south-west Asia. Adult apterae of Thelaxes suberi vary in colour from pale green to dark brown (see pictures below). The terminal process of the sixth antennal segment is 0.26-0.40 times as long as the base of that segment. The hairs on the abdominal tergites are long and conspicuous; those on tergite 5 are mostly more than 25µm long, and very thick and dagger-like (cf Thelaxes dryophila which only has short dorsal hairs and those on tergite 5 are spine-like). Thelaxes suberi siphunculi are very short and the knob of the cauda is at least as long as broad. 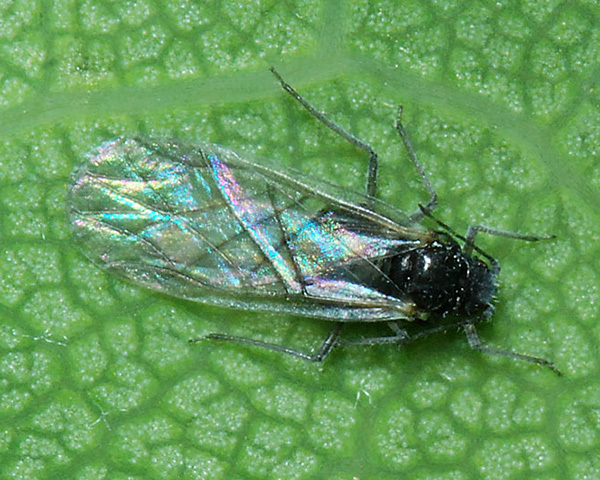 The body length of adult aptera is 0.9-1.5 mm. The alate (see second picture above) has a black head and thorax with the antennae, legs and areas around the siphunculi dusky. The abdomen has conspicuous dark marginal plates. The wings of Thelaxes suberi are folded horizontally, rather than tent-like, over the abdomen. Immatures are greenish-yellow sometimes with pinky-brown patches. Thelaxes suberi live on the young shoots, leaves and developing acorns of many Quercus species, especially Turkey oak (Quercus cerris) and holm oak (Quercus ilex). 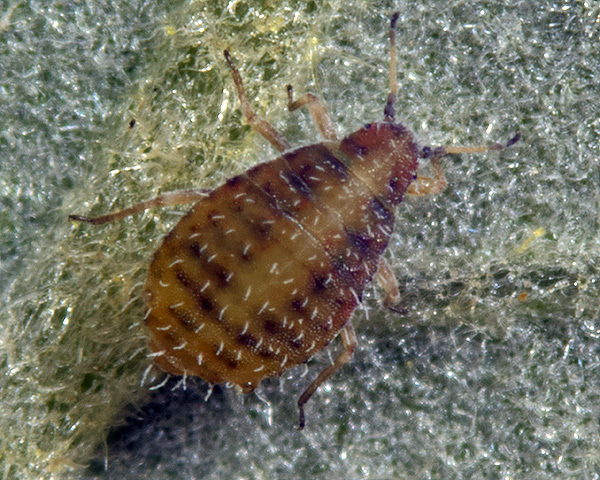 Immature sexual forms appear at the beginning of the summer, aestivate through the summer, and then adult oviparae and males occur in autumn. Thelaxes suberi is present in England, southern Europe, Mediterranean region, southwest Asia and South Africa.